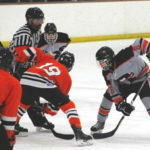 The Rockford Rams Varsity Hockey Club traveled to Patterson Ice Center last weekend for a pair of games against OK Baum opponents. 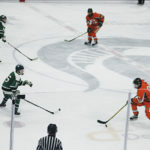 On Friday, Jan. 18, Rockford battled Forest Hills Central and on Saturday, Jan. 19, the Ice Rams squared off against East Grand Rapids. Friday night games have not been kind to the Ice Rams this season. Two of the three losses the boys have suffered have happened on Friday nights. Rockford headed into the Jan. 18 contest against FHC looking to break this pattern. Despite outshooting the Rangers, Rockford once again come up on the short-end of the scoreboard at the end of the night. FHC scored the first four goals of the game; taking a 2-0 lead in the first period and a 4-0 lead in the second period. In the third period the Rams made a goaltender change, hoping to spark the team. With about 5 minutes to go in the game, Cade Baumgardner (assisted by Dan Sokol) made it a 4-1 game. The Rams continued to pressure, hoping to seize some momentum, but was unable to complete the comeback. FHC tallied an empty-net goal late in the game to secure the 5-1 win. Rams goaltender Zac Sherman took the loss; Caleb Keely saw playing time in the third period. 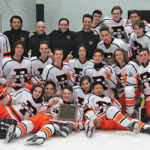 Looking to rebound, the Rams headed back to Patterson Ice Center on Jan. 19 to face EGR. This game went much better for the Orange and Black. Rockford jumped out to an early 1-0 lead on a goal by Kevin Healy (assisted by Baumgardner). The Rams took this lead into the first intermission. Despite several quality chances by both teams, there were no goals in the second period. Early in the third period, Ethan McCormack (assisted by Aidan Hoffman) scored an insurance goal on the powerplay, giving Rockford the 2-0 lead. From there, the Rams defense held strong. As the final horn sounded, the scoreboard read: Rams 2, EGR 0. Sherman recorded the shutout win for Rockford. Up next for the Rams (12-4-0 overall, 6-1-0 in league play), the boys go on the road for a pair of OK Rue league contests: on Friday, Jan. 25, Rockford travels to Holland to face West Ottawa at Griff’s West. Puck drop is slated for 5:00pm. On Saturday, Jan. 26, the Ice Rams travel to Georgetown to battle Grandville at Griff’s Georgetown (formerly Georgetown Ice Center). Puck drop for this game is planned for 2:30pm. You can follow the Ice Rams online at RockHockey.org or on Twitter, Instagram and Facebook. Go Rams!